Is it time to blow out PC air cooling for good? An effective piece of kit, but is water cooling too much hassle for the casual PC user? Even today, people who express an interest in water cooling often caveat themselves with a phrase like 'putting water near a PC can't be good, can it?' Manufacturers have put a huge amount of effort into getting people over this initial hurdle, yet it remains the first thought of many. Modern liquid coolers, though, are very leak resistant. They're often supplied both hermetically sealed and pre-filled. Not only that, but even if fluid did splash on your motherboard, there's a good chance it wouldn't do any damage. We don't recommend deliberately moisturising your PC, but leaving components to dry for 24 hours or so usually prevents them from coming to any harm. In any case, according to water cooling's proponents, the advantages far outweigh the dangers. Greater system stability and cooler case temperatures should extend your PC's life, balancing the financial risk of component damage quite nicely. These arguments are fairly sound, and explain the take up of water cooling by data centres, where small cost reductions can mean big savings. Vendors of water-cooled systems are applying the same logic to move out of the extreme gamer niche and into the world of workstations, where low noise is particularly appealing. For the public, though, the biggest problem is cost. Water cooling became popular when standard air heatsinks were little more than metal with a loud fan on top. Thankfully, we've moved on since then. Large fin arrays and heat pipes coupled with cool-running CPUs mean that a £30 copper heatsink provides a great return on investment without giving your office the acoustic signature of Runway Two at Heathrow. Then there's the fact that cooling the CPU isn't the weak spot in most liquid-chilled PCs – it's cooling the coolant that's the problem. Fluid is passed through an aluminium block that sits on the PC like a traditional heatsink, absorbing the warmth and taking it away to... where? In the past, it's been piped to an external radiator unit, but now we're seeing more chillers sitting inside the case, like the CoolIT Domino. A passive radiator is only as cold as the ambient temperature, though, so whether the radiator is internal or externally mounted, you'll need something to cool the fluid before returning it to the CPU. 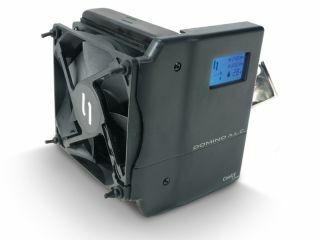 And as soon as you start adding fans or thermoelectric coolers (TECs), you're also increasing the system's noise output. So the to-and-fro continues. Large air coolers put a lot of pressure on the motherboard and are often too big for ATX cases. Water cooling the CPU, on the other hand, can lead to a false sense of security when it comes to overclocking. What about the extra heat generated by bus controllers and graphics cards? By removing the CPU fan you're also removing one of the forces that push air through the case. Perhaps, though, it's the masses who have it right. When testing one sealed liquid cooler, everything was going fine until we put too much pressure on one of the pipes and pulled it from the intake valve on the pump. This was a user error, certainly, but the system can't be refilled without being sent back to the company. You don't get that sort of inconvenience with air coolers. Water cooling will continue to have its advocates and a slowly growing mainstream audience. We can't complain about that – it's fun, and can indeed be very effective. Just don't expect it to be as easy as the ads might have you believe.